In 2009 Allyson Reedy broke the chain. She stopped eating meals, snacks and goodies from the chain restaurants that line America’s streets and dominate our stomachs. Her food memoir, Breaking the Chain: How I Banned Chain Restaurants From My Diet And Went From Full To Fulfilled, chronicles her year-long experience as she sought out local alternatives to the food we’ve come to rely upon. 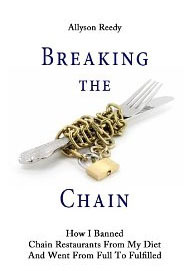 Breaking the Chain is Fast Food Nation (Eric Schlosser) told from Carrie Bradshaw’s point of view (if she loved manicotti as much as Manolos). It’s about passing up ritual office breakfasts of bagels and donuts. It means having awkward conversations and waiting longer for food. It involves breaking social customs and inconveniencing friends. It necessitates supporting your neighbors and local community. It also means discovering new favorite foods, saving money and (for Allyson) losing weight. Breaking the Chain began with Allyson wanting to eat better tasting, more adventurous food. After watching friends, family and strangers eat unsatisfactory meal after meal at chain restaurants and get fatter as a result, she wondered how we could break this chain of mediocrity, obesity and commercialism. By giving up corporate-controlled meals, she figured she could achieve her goal of eating the most delicious possible food and maybe even learn something about her eating habits along the way. The experiment turned into so much more than tasty food. Somehow, eating guilt-free turned into the world’s easiest weight loss method. During the worst economic downturn of our lifetime, it became a means of keeping community restaurants in business – and neighbors employed. It’s possible Allyson reduced her carbon footprint by half a step and increased her life by a few years. She unwittingly became social commentary and got in a battle with The Man. In other words, it got interesting.